Normandeau, J., Meertens, C., Bartel, B. 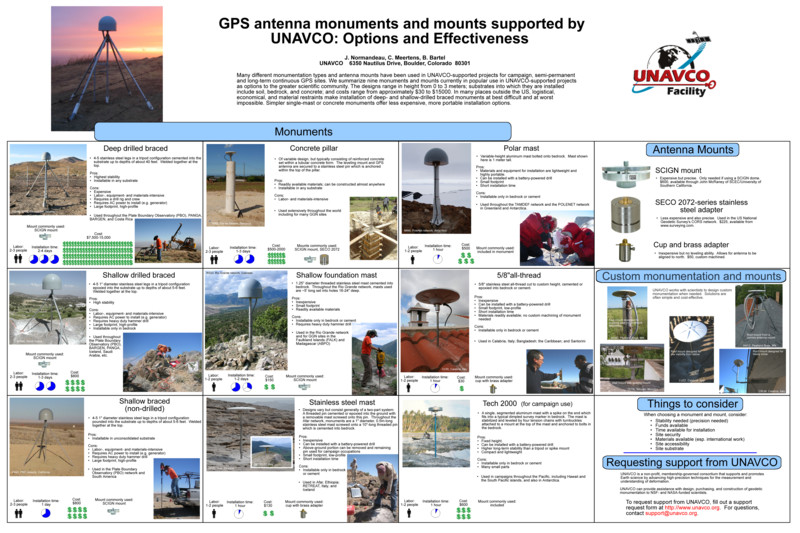 Many different monumentation types and antenna mounts have been used in UNAVCO-supported projects for campaign, semi-permanent and long-term continuous GPS sites. We summarize nine monuments and mounts currently in popular use in UNAVCO-supported projects as options to the greater scientific community. The designs range in height from 0 to 3 meters; substrates into which they are installed include soil, bedrock, and concrete; and costs range from approximately $30 to $15000. In many places outside the US, logistical, economical, and material restraints make installation of deep- and shallow-drilled braced monuments at best difficult and at worst impossible. Simpler single-mast or concrete monuments offer less expensive, more portable installation options. Posted by: Beth Bartel - Fri, Mar 26, 2010 at 5:04 PM. This article has been viewed 3223 times.